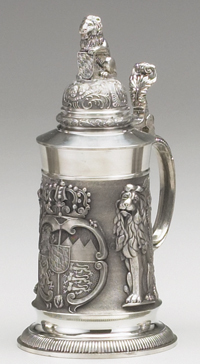 This very impressive 11 1/4" German stein displays three proud lions guarding the crest of Bavaria. On either side of the crown and shield we find the majestic animal in deep precise relief. Antiquing and high polishing are used in selective areas to frame the stein. The impressive pewter lid has a figural Bavarian lion figurine holding the famous diamond crest of Bavaria.